I had an unexpectedly yarny Christmas with my youngest niece and nephew, who were visiting from Florida. I’d gotten an 11th-hour warning that they were looking forward to a tree, so I bought a little tabletop number — one of the last left at Target — and we spent Christmas Eve decorating it with pompoms, the whole family. That night, Nephew found the rejected Regular Guy Beanie in my knitting bin and instantly claimed it. (It’s his favorite color.) He wore it every day. I’d gotten Niece a ball of Cascade Yarns’ Tweed in “Hot Pink,” which looks just like bubble-gum ice cream, thinking we might try finger knitting at some point. She took me up on the offer to use some of it for mini fingerless mitts, and then her brother requested a pair for himself, to match his hat. So our various car trips around the Bay Area all involved me sitting between them in the back of the rented mini-van answering their questions as I made their tiny mitts. We did squeeze in a little finger knitting at one point — a fancy bracelet for me and a necklace for the princess. But the most surprising part was that Nephew wanted to learn to knit. This should not have surprised me, since his primary character trait has always been wanting to know how everything in the world is done. But he’s not always as determined to do things himself as he was with this. I showed him the knit stitch and sent him home with some yarn and a couple of pairs of straight needles. He may immediately forget he was ever interested in this, who knows, but I’ll never forget his sweet little self bent over those few garter rows, determined to get the hang of it. 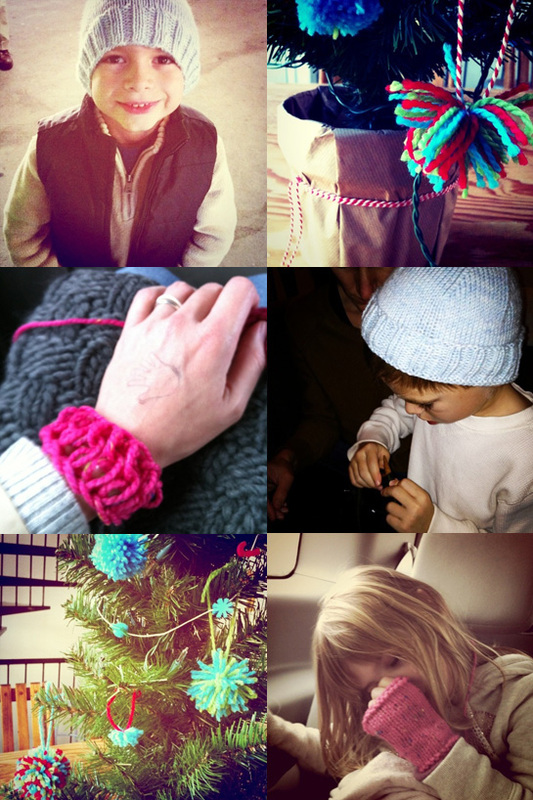 This entry was posted in Projects, Thoughts and tagged kids, knitting. Bookmark the permalink. Sounds like the visit was a great success! We love pom poms too. How do you finger knit that cool bracelet? My girls would love that! Hi, Millie. (Yours is the first comment on the new blog! I feel like I should send you a prize, or pin your comment to my wall or something.) It’s just standard finger knitting, as I know it. It’s just sort of loose because it was done on my big hands instead of Nina’s little ones. I “knitted” until the tube was about as long as my wrist is wide, pulled a knot at each end, and used the two tails to tie it on. I think it might technically be considered “inside out” which might be why it looks different to you. The knitted ridges are on the underside, in this case. Does that make any sense? Hard to describe rather than showing it. I’m going to try the bracelet. It’s very cool. Sorry, it *is* hard to describe knitting. I just thought there was a blog post or something you could point me to. Cheers! I should post the version I did with a super bulky. It’s actually pretty great — got me wondering what you could really do. I’m sure you’ve seen this huge blanket that’s been making the rounds on Pinterest, etc? She made a youtube vid showing her knitting with slightly felted roving on PVC pipes. (!) Supposedly the blankets only take a couple hrs to knit bc there are so few stitches.